Today we are interviewing LORD TOPH, author of "The Girl Who Cannot Sneeze." I am an artist, composer, producer, and a writer. I have written many volumes of poetry, as well as works in short story and novel length. Creative writing is a big passion of mine, I must admit. Well… The story is about a young girl named Icha, that lives on a peaceful little island called, Kimp Pu. Icha is a perfectly happy and normal young girl, but she is not too pleased to know that she can’t sneeze. So, with the help of her aunt and friends, she begins an experimental mission to make herself sneeze. In the process, Icha and her friends learn a few valuable lessons they’ll carry with them throughout life. Whenever I think of children’s stories with morals and important fundamentals, I think of the conscious parents that still want to teach courtesy, good manners, and etiquette, and work hard to pass it down to their children. So, perhaps the caring and conscious parent(s) that still loves to teach and read to their children… That’s who I feel would most appreciate this book. 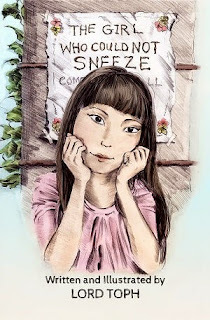 What inspired you to write a story about a girl’s inability to sneeze resulting in rich discoveries and experiences? (Smiling) Well… actually and quite ironically – The story was inspired by a dear friend of mine that sneezes all the time. And humorously, each time she begins to sneeze… there is a slowww prelude of “icha… ichaa… ichaaaahh,” before the sneezing finale. This is where the main character in the book, Icha, gets her name from. One day I thought, “What if she (my friend) just stopped sneezing altogether… how relieved and happy would she be?” The irony of her not being able to sneeze is what gave me the idea for the story. Tell us a bit about the protagonist, Icha. Aha… Icha. She’s a kind sweet-spirited young girl, who lives with her aunt. Icha is quite responsible and mature for her age. Though she is soft-spoken, she is somewhat of a quiet leader among her peers. The story is set on the small island of Kimp Pu. Was this island inspired by places you’ve been? (Chuckling) I’d like to say it was… but in all honesty, no. Classic stories like “Robinson Crusoe,” “Treasure Island,” “Peter Pan,” etc. have always fascinated me with the setting of an island. So I thought an island would be the perfect place for Icha to grow up. Humor is a big part of the book. Has humor always been a part of your writing or is it something that developed recently? Yes, I would say that many instances in the book are humorous, but there are those endearing moments as well. Humor, I feel, is an essential component to incorporate in children’s literature. Everyone should have a laugh – especially children. Icha, of course! However it was fun creating, Mrs. Mei Lu… She’s a gas! I’ve been illustrating from the time I could actually hold a pencil or a pen. It’s been a long time… too long to tell (smile). What did you hope to accomplish with the illustrations in the book? I hoped the illustrations in this book would give young readers/listeners more visual insight on Icha, Kimp Pu, and the occurrences in the story. Can you tell us a bit about the creative process of the book, from the initial idea to writing/illustrating to the published book? I’m usually isolated during the creative process of creating a story – Head down, looking at drafts of scribblings on paper, or eyes on the screen of my pc… drinking Earl Grey, lots and lots of Earl Grey! I suppose there is always that moment or two where every author pauses in the midst of literary mindset and says, “Now, huh? What?! ?” It’s always those little moments that make you feel a bit apprehensive, but you work your way through. How do you hope readers are impacted by reading “The Girl Who Could Not Sneeze”? Happy… fulfilled… and perhaps they’ll want to read it again and share it with someone else. Ahhh… you’ll have to visit StarField Stories to find that out (smiling). But, I’ll give you a bit of a hint. It’s a picture book, and it should be released this summer. Saying this not as an author, but someone who merely enjoys a good story… It’s a heart-warming tale that I personally will cherish. "Hey, wait a minute! I haven’t heard you sneeze one time today. In fact Icha… now that I think of it… I don’t think I have ever heard you sneeze!"